I'm lucky in that my house overlooks this bay. Things have been relatively quiet around here lately haven’t they? Sure, I may have just posted about my excitement for the upcoming Donkey Kong Country Returns later this week but aside from that, I have maintained a silence on this blog that I’m not proud of. It wasn’t intentional -- of course it wasn’t -- but it was perhaps necessary, as I just couldn’t bring myself to put the effort in to write the various posts I wanted to write. I was feeling this way not because of a disinterest in writing -- in fact I’d argue my passion for writing is stronger than ever -- but because, when combined with the various games I was trying to play, I just felt too overwhelmed and depressed. The gaming blues aren’t new, we all go through it from time to time, but in my case this instance was particularly severe and was exacerbated by my stubbornness, among other things. See, despite feeling uninterested in playing games for a while I did so anyway and it was definitely to my detriment. I tried playing Red Dead Redemption, already a game I’ve struggled to enjoy due to reasons I’ll elaborate on shortly, and didn’t enjoy it. I tried continuing the Metroid marathon I’m undertaking currently and that wasn’t appealing either -- and that’s one of my favourite franchises around. The only game I could enjoy was F1 2010 and I have a feeling that was more due to my passion for motorsport rather than my enjoyment of the game itself, that and it’s the time of year where real life motorsport is wrapping up for the year, if it hasn’t already done so. This lack of interest saw me try a few new games, such as Batman: Arkham Asylum, in order to try and reinvigorate my passion for gaming and while Batman was interesting, it just wasn’t the right time to play it so it too became a culprit of my animosity towards games. Mentally, I knew this boredom (if you will) was temporary and in no way reflected how I felt about the medium as a whole, or the individual games in question, and I guess knowing this only frustrated me further when it came to how I was feeling. The icing on the cake was seeing all of the games still yet to be played sitting on my shelf, knowing full well that they’d continue to sit there if I waited out this bout of gaming depression and that they wouldn’t be as enjoyable if I tried to persist through it. Furious (mostly with myself), I just decided to stop everything I was doing or planned on doing -- which included my plans for this blog -- and stopped caring until I was ready to re-engage. While gaming blues may have been the biggest reason, it wasn’t the only one. Various life commitments affected my ability to get anything done, as did illness and reoccurring wisdom teeth pain. The aforementioned motorsport also took up time, as did the unfortunate circumstances of my grandfather being in hospital (he still is, actually). I've named this Lake Hylia as a mark of respect for Zelda. So, Minecraft. Everybody has heard of it by now and I certainly don’t need to go on about why it’s so popular. Since it’s the other primary reason for my silence here on the blog, however, I do need to explain why I’m so enamored by it, and why I continue to play it more than I should. Before I do that I should explain what got me into it in the first place, so let’s start with that. When the game started to show signs that it was becoming a phenomenon, I was uncertain as to why and still didn’t really understand what the game was about. 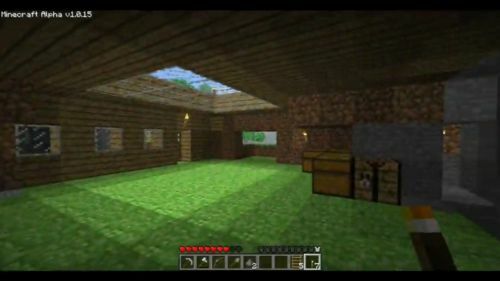 When I heard that you mined the world and then crafted from those materials, I thought it sounded boring but also had a feeling that, like most games, there was more to it than initially sounded. So, as I watched more and more people -- particularly on my Twitter feed -- praise the game’s quality, I not only started to form more of an interest in it I also started to learn more of why it was just so good. Then the press got their hands on it, and sites like RockPaperShotgun and GiantBomb begun singing its praises just as much as the gaming community. These articles enlightened me further, particularly showing off its unique art direction through screenshots, and my interest continued to grow and grow. I asked friends about it after they shared articles; I observed conversations as people discussed it; and then I found the thing that converted me to the game’s charms: videos of people playing it on YouTube. Ah the X-System, how I miss thee. I had heard of the “Let’s Play” community vaguely and knew roughly what it was about, but it was LPs centered on Minecraft that didn’t just convince me that these series of videos were worth watching, but that they could be thoroughly entertaining too. I started with a tutorial video on how to survive the first day and night on Machinima. Fascinated, I was led to the guy’s channel where I found a series chronicling his adventures in the game, complete with live commentary. I watched the first video, then the second, then the third and continued until, hours later, I was halfway through the series. I was completely enthralled by not only the unique events occurring in his adventures, but the game itself, and all the while I was learning not just how to play the game but why it was so popular and brilliant. Over the next few days I proceeded to marathon the rest of his series -- a massive 40-plus episodes -- as well as check out some of the other Minecraft LPs I kept hearing about through the comments and X’s (the guy behind the videos) own recommendations. This led to Coe’s Quest, another series that I became hooked on and, as he is still uploading new videos, I continue to watch to this very day. Like X before him I was fascinated with what Coe got up to, what features his world contained --and it has to be said, Coe’s world is one of the best Minecraft worlds I have ever seen -- and even learned some new things off him as he created enemy spawner traps, new tools and approached situations differently. An interesting byproduct of watching both his and X’s videos was the realisation that firstly, while similar these two adventures weren’t Let’s Play videos in the traditional sense and secondly, that I was beginning to understand just why I was so captivated by this game. Predictably, I caved and bought the game and proceeded to join everyone else in singing the game’s praises. 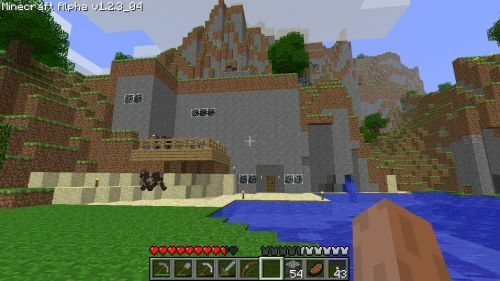 Initially, I was somewhat hesitant to play it as it was my first PC gaming experience in a long, long time and I just didn’t feel comfortable inhabiting my own version of this vast, empty and harsh world that Minecraft is famous for. I was also too busy enjoying myself when watching the game be played by Coe (I marathoned his series too -- it’s now up to episode 82) and a few others, the ability to watch someone else do the hard work (so to speak) more enticing than playing it myself. But eventually the addiction and fascination took over and I created my first world, excited and nervous with what I’d find and what could happen. It was poignant sharing this particular moment with Coe. 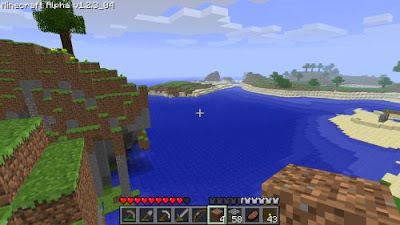 Spawning on a beach I did the now common routine of punching some trees for wood and going on a search for coal. My first discovery of it was a fair walk from my spawn point but close enough that I knew where I was if and when I died. As night drew near I dug into the same mountain that the coal was found, creating my first shelter in order to survive the night. Watching the videos as I did I knew what to do in these circumstances and had a rough idea of what I wanted to do now that I was established, so as night fell I began to dig further into the mountain to see what it held. Finding nothing in my tunnel and realising that the sun was rising, I created some more tools and went outside to gather some more basic resources -- lumber, sand, dirt and some more coal -- before climbing to the top of the mountain to survey my surroundings. Impressed with the view, I realised that I wanted this mountain to be my home and my mine, so I began to dig straight down with the plan to not stop until I hit the bottom. Fast forward a bit and I had established my home right where my first shelter was; reached the bottom of the world and bedrock -- a feat considering the peak of the mountain is practically at the highest point you can go in the game -- in my mine; created a branch mine in order to find rare minerals such as gold and diamond (which I did find by the way, lots in fact); explored some of the caves that were close to my mountain; and had lit up a path to spawn with the intention to make something of it later. Making a mark on this land and establishing my base of operations, I was ready to not only get more creative with the appearance and design of the things I had created, I was also ready to go exploring and find new things to discover and do. What these are I might detail in another post but the point is that, like everyone else who plays Minecraft, I worked with what I had and made the most out of it, thoroughly enjoying what the game has to offer in the process. That’s all well and good, but what does the game offer me that ensures that I enjoy it as much as I do? Well, as I alluded to before, the videos I watched started to highlight why I found the game so compelling and playing my own version of that just confirmed it. 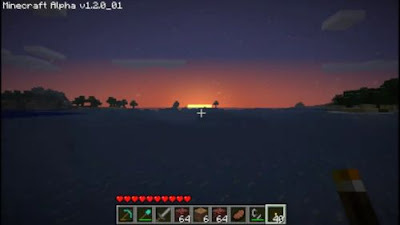 Minecraft is interesting to me for three reasons: the beautiful worlds the procedural generator creates; the personal stories (which explains why the videos were so interesting to me in the first place) that stem from them and the amazing things that can be done with so little. It’s these three features that form the core of the Minecraft experience for me, a fact I find interesting given the main mechanics -- and thus, interactions -- are barely related. Sure, they’re the primary means with which I engage my world, explore it and craft my own narrative, but the actions in themselves bear little to no relevance. Mining for materials is just something that needs to be done from time to time, to gather the things required to build something, create new tools or to ensure safety when travelling at night; the minerals themselves take on a different meaning when stumbled upon, unexpectedly, whilst exploring a gigantic cave system or after digging somewhere for an unrelated reason, such as to build a tunnel. Mining these discoveries isn’t about the actual mining, nor the need to do so, but the simple reward for taking the time to check out something interesting, intentional or not. Crafting is even more insignificant, the end result sometimes fascinating -- when creating a new object or the final part to a much bigger plan -- but the action just something that… happens. I just find this point interesting because, indirectly, most videogames are (or should be) about their mechanics: how you interact with the game’s world, characters, items and objects, and everything else. Interactivity is the means to our selfish ends and as such, it’s important that they accommodate our desired needs and do what we expect them to do. Minecraft’s primary actions do indeed successfully fulfill our expectations but the experience -- at least for me -- is never about them but rather what they allow, and I just found that intriguing the more I considered it. As for the worlds, the stories they have told and the creations I’ve produced, I’ll save those thoughts for future posts. Needless to say, like practically everyone else who has played the game, Minecraft blew me away and continues to surprise me every single time I play. Few other games can manage that and I think that’s why it has reached levels of popularity that some Triple-A blockbuster titles would envy. 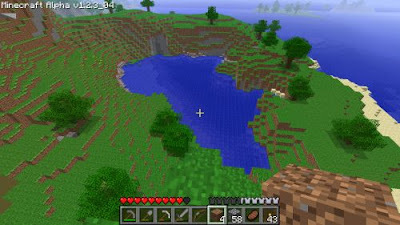 Deservedly so, too: like the way in which it’s played, Minecraft made the most of what it had and little else. Enough said. ROBLOX is driven by an ever growing community of over 300,000 creator players who provide an infinite variety of highly immersive experiences. These experiences range from 3D games and contests, to interactive adventures where friends can take on new avatars imagining what it would be like to be a dinosaur, a miner in a quarry or an astronaut out in space.